An essential tool for your best homemade breads. Crafted in France out of Burgundy clay, this stoneware pot is specially designed for maximum, even heat retention. Whether you're baking no-knead bread, making a stovetop soup, or cooking a casserole, you'll get consistent, reliable results every time. The durable pot can be used on the stovetop and in the oven. The elegant design is pretty enough to use as a serving dish, allowing you to take the pot straight from oven to table. 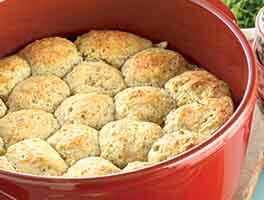 Lid traps steam as bread bakes to help achieve a crispy crust. 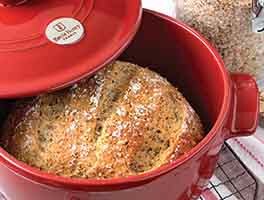 Perfect for creating artisan loaves of bread in a home oven. More lightweight than traditional cast iron Dutch ovens, we love how comfortable it is to carry to and from the stove. You can even preheat the pot empty in the oven in preparation for baking your bread, if the recipe calls for it (it's not recommended to preheat it empty for any other purpose). Microwave-, rangetop-, freezer-, and dishwasher-safe. Oven-safe to 800°F. Remember that New York Times article that caused such a sensation in artisan bread-world? 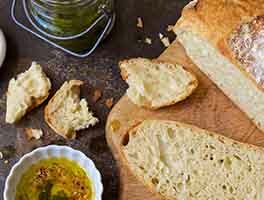 It detailed a special method for making wonderful, crusty bread with a very slack, no-knead dough, baked in a cast iron crock. We've spent nearly a year testing different baking crocks--size, material, shape--and have come up with the one we think works the best: this beautifully hand-crafted French stoneware crock, from Emile Henry. Note: While the New York Times recipe calls for the crock to be heated before adding the bread dough, we actually let the dough rise right in the crock, then put it into a preheated oven. It works fine, and saves us the worry of heating an empty baking dish in a very hot oven. You can preheat the pot, empty in the oven, in preparation for bread baking if you'd like though -- either method will yield great success!